Content by Tony Macklin. Originally published on February 4, 2015 @ tonymacklin.net. Still Alice faces several potential pitfalls. It eludes most of them. It avoids being just another Lifetime tv movie. Obviously the Oscar-nominated performance by Julianne Moore elevates it above the lesser genre. Her performance isn't showy, but it's memorable. She'll win the Oscar, given the nature of her role and her skill in embodying it. Moore portrays Alice Howland, an accomplished linguistic professor at Columbia. She turns 50 during the movie. Alice has a husband John (Alec Baldwin), and three adult children - Anna (Kate Bosworth), Tom (Hunter Parrish), and Lydia (an outstanding Kristen Stewart). When her mental faculties begin to fail her, she goes to a neurologist. Tests subsequently reveal she is afflicted with early-onset Alzheimer's. The film focuses on the resourceful woman's coping with the terrible degenerative disease, and its effects on her and those around her. The film is based on the novel by Lisa Genova, whose grandmother in her mid-eighties was discovered to have Alzheimer's. Lisa is a neuroscientist at Harvard. The film is co-written and co-directed by Richard Glatzer and Wash Westmoreland. Glatzer and Westmoreland are married to each other. Westmoreland's early career included making gay adult films. 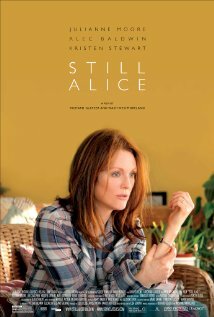 One realizes that Still Alice is personal for them. Glatzer was diagnosed to have A.L.S. It's a cruel irony. Glatzer and Westmoreland are able to relate first-hand to the debilitating effect of disease. But for Glatzer, it's basically physical; for Alice, it's mental. Her mind leaves her. Both diseases are horrible, but they're not the same. In their screenwriting and directing of Still Alice, Glatzer and Westmoreland avoid pitfalls. They are smart enough not to use the expected cliches of the genre. In the film, it seems that John may have a mistress. He doesn't. When Alice gives a talk - based on Glatzer's experiences - to an Alzheimer's association, she drops her papers. She's going to be humiliated. She isn't. One of the strengths of Still Alice is that Alice never is publicly humiliated. An appropriate alteration that Glatzer and Westmoreland make is changing Alice from being a professor of psychology into being a professor of language in the film. It is an apt transformation, since language is so crucial to Still Alice. But Glatzer and Westmoreland do make some missteps. Their treatment of how Alice is stopped from following her plan is contrived. In the book, John interrupts her, which seems more credible. At the end of the book, Alice is holding a baby who reaches for a butterfly necklace. At the end of the film, no baby. What is most questionable is the heavy emphasis on HIV/AIDS. The film makes the connection between Alzheimer's and AIDS. It makes the point effectively earlier in the film, when Lydia asks Alice about people she knew who had AIDS. The film offers the comparison that victims of both diseases were shunned and misunderstood. Yes, but Alzheimer's is mental. Mental. At the end of the film, AIDS upstages Alzheimer's. In the book, Lydia speaks a monologue to Alice from an unidentified play. In the film, it is a lengthy speech from Tony Kushner's Angels in America, Part Two: Perestroika. Director Gus Van Sant cleverly and effectively included a gay subtext in Good Will Hunting (1997). He was never blatant. Glatzer and Westmoreland are. As lyrical as Angels in America may be, it hijacks the focus. Earlier in the book, Alice had watched a DVD on tv of King Lear with Laurence Olivier. Glatzer and Westmoreland choose Kushner over Shakespeare. Where are you, Cordelia, when Alice needs you? "And so I am! I am!"